Welcome to Fantasy Football Live Match Chat Gameweek 19. WAKEY, WAKEY! Christmas is over. It’s FPL time again! You’ve had your day off and as much as we hope you enjoyed your turkey and wine it’s business time again. We’ve even posted this an hour earlier than normal as a big fat warning that GW19 starts today at 11.30am. It’s a whirlwind GW this one as we start today with no less than 9 games on Wednesday and finish tomorrow with just the one outlier. We then get Friday off before we begin again on Saturday. 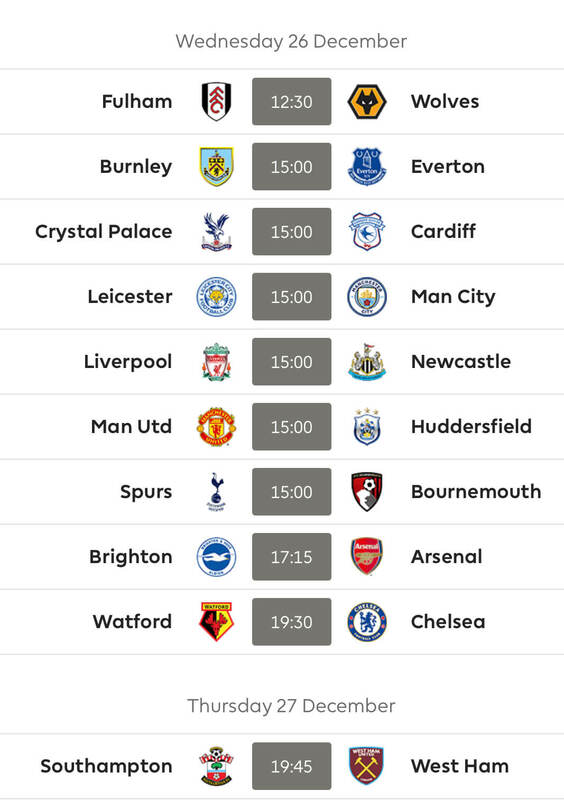 Fulham and Wolves open Boxing Day for us at 12.30pm before we see 12 teams contest 6 games at 3pm and there are some big hitters featured in there with Man City, Liverpool and Spurs all in action. Man United play too. Brighton and Arsenal play at tea-time at 5.15pm before Watford host Chelsea in the evening game at 7.30pm. Saints vs West Ham finishes us off on Thursday at 7.45pm. 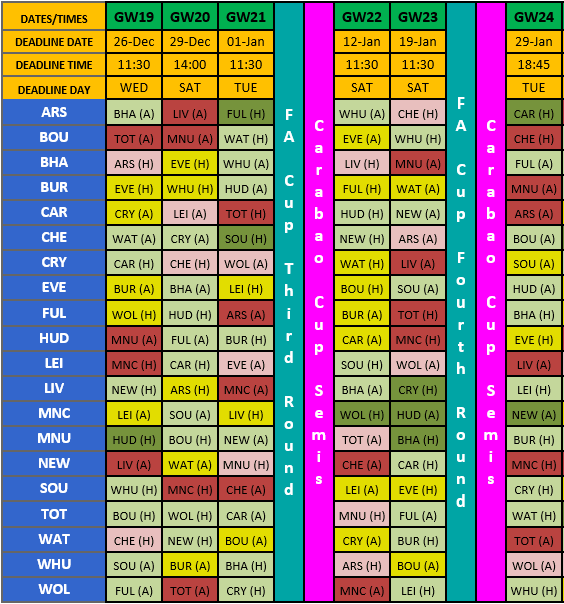 Good luck to absolutely everyone for Gameweek 19 from all at FF247! Thanks for reading Fantasy Football Live Match Chat Gameweek 19. Had a terrible December, fell about 100k places this month with so many bloody red arrows. Been top of my mini league from game week 8; now in third place, granted only 16 points behind the leader (who happens to be my brother in law). You and Rosco need to get a room. Not sure what you’d do in it, mind you. Do you like dogs?! Haha I’m actually feeling quite positive! Surely when you drop as low as I have it shoulda make getting some greens easier… in theory!! Jamie – I’ll happily change ranks with you mate It’s all relative. Hang in there. If I can stick with it at 850k you ‘ll surely carry on. Anyone around? Would it be worth 8ph to bring in Anderson for Hogg and Calvert Lewin for Jimenez? I think I would make up the points in a couple of weeks? Yes I am eresh. You too? I often have the silly urge to “fix” my team asap. Thank God I seldom go with them. How has your week been? Mine 70 pts. Truthfully I don’t know if Anderson or Pogba is going to be the best one to go with in the coming weeks…we will see. From the UK but can’t sleep. It’s been average. Lost my ml spot 2 weeks ago and now 5th. Anderson might be as he looks to be the most attacking player for an injury hit West ham. You have a Twitter handle? Oh dear…not being able to sleep is no fun. Hope this improves soon. Sorry, don’t tweet. I have enough just keeping up with calls, texts, emails etc. 80(my 2nd highest score this season. And without 26 points on the bench too!! )points finally!! Last game week was the turning point, hope its the start of a the recovery. The chase up the table. Just sneaked back to the top 10 in my friends league. The pack aren’t too far ahead can still catch them. Anyways got a 2 FT and got rid of Ryan since he hasn’t been keeping clean sheets for a while and now away. Got 1 FT left, was thinking of downgrade Patterson to Camarsa or some other midfielder that is cheaper so i can get some funds to use to upgrade some players the next time i get 2 FT.
Other then that i don’t think there is much to tweak except more of the same again please! Do I have the right formation for this team? Evening all! I hope you’re all raking in the points this GW! Doing so-so with 53pts and 3 to play. My team is in a bit of a mess, so I hit the WC. Probably could have waited though. Not having any City coverage seems weird/wrong.